y head is spinning. I am tired and slightly off focus. There are so many things to do. So WARNING! This blog might implode, explode, or ramble down strange and mysterious paths. I just don’t know! And I don’t care. First… I have been participating in the short story competition ProjectREUTSway this month and have completed three out of the four challenges. I took a boat ride through the Egyptian underworld to bring light to a people lost in darkness. In week two, The Morrigan of Celtic lore offered a group of boys a chance to live rather than die in a fight. Last week, young Yori lost his mom, dad, and little brother to the evil Japanese demons known as Oni (which will someday become a NA horror manuscript). This week, I am bringing the Russian rusalka, a female ghost, into a world I get to create, writing a new myth. Last night, writing was a struggle. I revising as I went, a big no-no if when there are hopes of completing a first draft. But every sentence needed something. Each word choice felt wrong. This is a case of perfectionism. I have suffered from this disease forever, but lately have been able to set it aside, until last night. Anyway, I have about 700 words of a story that must be at least 2000 words. Not bad. I have to get this draft done today in order to keep what remains of my sanity. Usually, the story is due by Thursday night, but, because of the holiday, we get until Sunday! On Wednesday we are traveling to my sister’s house for Thanksgiving! Oh, the family fun. The chaos of all the cousins! Very little writing will be occurring. Hence the I HAVE TO GET A FIRST DRAFT DONE TODAY. Let’s hope I’m not sitting here staring at words at 1am. Totally stole this from someone off Twitter last night, cause… HA! Fairy dust and wishes will be accepted all day. You know what? I love it. I am so grateful to have this craziness be my life. I chose it, right? I am glad to have a chance to write these stories, even if they end up horrible. I am SUPER EXCITED to see my family at Thanksgiving! I love us, we’re awesome. A little weird, but fabulous. We’ll chat all weekend about EVERYTHING. It’s just what I need to recharge and get myself ready for what’s next. Fingers crossed for great things. There will be GREAT THINGS, PEOPLE! Believing is the magic. As I go back to my words, I shall let go. Release all the over thinking devils and write. I won’t stress over the three pies I need to make, the laundry that must get done, and the packing. I won’t let puppy training push me past the edge of reason. Life is a gift. I am thankful for every little moment. Writers write. And write. And write. But we don’t do this for the heck of it. We have things to say, stories to tell, characters in our brains THAT WON’T STOP TALKING! Finally we have a complete manuscript. WOO HOO!!!!! Right? Maybe. But what do we do with it? Self-publish? Traditional publish? Find an agent? WHAT? All of the above. It’s as simple as that. Well, one person shouldn’t do all at once for one manuscript. That would be crazy. But choose a path, a path that makes you happy, a path that isn’t too hot or too cold, but just right. And no path is easy. I know writers with agents. I know authors who self-pub. I know people published through small presses. I know someone who got an agent and then a book deal, someone who self-pubbed then got an agent. The one thing to remember is we all write and together we make this business great. Me? I tried agents, but that never felt right. Self-pubbing is too scary for me, I want someone to help me on the way. So I’m trying small presses. They’re out there. They want your manuscripts. Why not? That path feels good under my feet. Having an agent? Awesome! A BIG high five to those who catch someone’s heart with your words. It’s great to have someone by your side. Not having an agent? Fabulous. You got this. Self-publishing? Wow! You go. I think those who get their books out there themselves are the bravest people. They get it edited. They work with people on the cover. They market. They DO IT ALL! And get all the money. And here I want to mention a new writer friend, who is bravely setting foot in the land of self-publishing. E.L. Wicker’s first book will be released on December 21st! I was honored to be included as a CP and can tell you what a fun story it is! Vampires. Witches. Great characters. And magic, people, magic. Now I haven’t seen the polished words, but I can’t wait. Go see the cover (it’s pretty!) and sign up for the giveaway here. Self-pubbed, traditional pubbed, agented, unagented… whether you enter contests or just query, we’re all in this together. I will cheer for you as you travel whatever writerly path you choose. I’ll share what I learn from my journey, if you share what you learn on yours. Deal? So this is my 100th blog post. What? Did I do that? Yes! I’d love to blow your socks off with some terribly awesome post that will change the world. But, sadly… I am just me. We have traveled back to one year ago today. The final day of the Susan G. Koman 3-Day Walk. The last twenty miles. Sore legs. Blisters. But the end was in sight. My sisters and I participated in this event to raise money to fight breast cancer. We walked 60 miles in three days. The volunteers who cheered us on. The people of San Diego holding signs and handing out candy and cupcakes (yes, cupcakes). The crew directing traffic all day long, but always sharing a smile. A fabulous time with my two sisters. I salute you: Janet (who lives with MS, never knowing if her body will cooperate or not) and Sharon (a now 2 year breast cancer survivor!). The best sisters. My sisters. I had no idea how that day would affect me. I had no idea that in those final miles a great sense of having been a part of something bigger would wash over me. Yes, I cried. The cheering crowds. The signs thanking us for walking. The people dressed in outrageous bras and pink EVERYTHING. I could have lost my sister. But I didn’t. Modern medicine and perhaps God saved her. As we crossed that finish line, passing the 60 mile mark, I lost it. What I had just done struck me. Before taking that first step, I was going on a walk. I was going to hang out with my sisters, no kids or hubs or house to worry about. Just steps. One foot in front of the other. Simple. Except not. It was more. It was everything. At the end, we donned our shirts, Sharon, the survivor, in pink and Janet and I in white. We joined a line of walkers, Sharon shipped off to the survivor line. First the white shirts paraded through a crowd. Faces I didn’t know, smiling and waving. And I wanted to hide. All I had done was walk. Then came the faces I knew, the volunteers that had been out on that course everyday in sweep vans, offering rides, or directing traffic, or handing out food. My heart swelled with thanks to them for what they had done for us, those who had walked. Walked to make the world a better place. After all the white shirts had filed in, those wearing pink came in to thunderous applause. And we took off a shoe, people, a shoe that had traveled 60 miles of San Diego, and we raised them in the air. In honor of these people who fought cancer and won. In honor of all the people who had fought and hadn’t won. And I caught sight of my sister. And I cried. Again. My sister made me a poster of our weekend for Christmas last year. So many pics. Memories. I stare at it all the time. Remembering. The handkerchief holding names of those who had fought or were fighting. My identification tag, covered with stickers, and the pink feathers I collected from the side of the road. The cards with the day’s schedule. I keep it all, these things represent so much. The world is a big place. Full of people. And being who I am, I tend to avoid it, hide in my house, writing words. But every so often we should come out of our worlds and experience something bigger than us. Be a part of all the greatness that exists out there in the world. 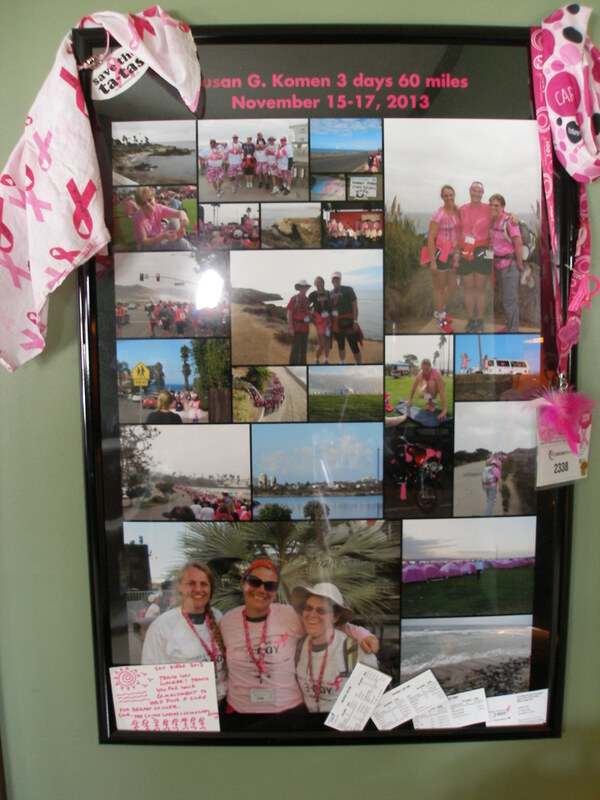 The Susan G. Koman 3-Day Walk was that for me. I will never forget that experience. And the fact that I got to do it with my sisters makes it even better. 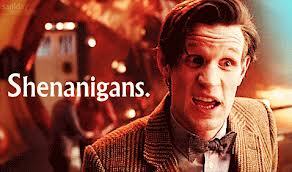 Go forth, all you fabulous people. Go forth and spread a smile. Add you to the world. It needs you. *whispers* I love Christmas movies. The Hallmark Channel and Lifetime become my best friends this time of year. I know! After all my creepy Halloween posts and horrific stories, you might need a moment to process the fact that I am a big softie, girlie, cry-baby. I have already begun recording movies. I set the DVR to catch all my favorites in the middle of the night when my addiction won’t interrupt anyone else’s TV viewing pleasure. In previous years, this teary-eyes, glued to the sappiest shows EVER event began after Thanksgiving. Last year, Hallmark channel wisened up and began before Thanksgiving because… SO MANY MOVIES TO PLAY. This year they began around Halloween. Just to save my skin I will say that I DID NOT watch any movies until AFTER Halloween. I’m not a heartless troll. Each year they replay the favorites and create new ones. My mom and I text and call each other a lot this time of year to compare what movies we saw that we loved, which ones we ignored (really, there are so many, if we watched them all we’d lose our sanity), and give opinions on the new movies. THIS IS A SERIOUS TOPIC PEOPLE. We give TIME to this. There are some titles that I pass on, I do feel guilty, but in the end it’s my life. I saw them and they didn’t do much for me. There are shows that I thought were cute and will have on in the background, so I can glance at them now and then for a smile. Then there are the movies that rate four stars that I watch. Then there are… *takes deep breath* … the FIVE STAR movies, the ones I CANNOT LIVE WITHOUT! The stories that make Christmas CHRISTMAS. A Season for Miracles. The Santa Suit. November Christmas. Holiday Inn. The Most Wonderful Time of the Year. The Christmas Ornament. When Angels Come to Town. White Christmas. A Christmas Carol. Christmas with Holly. My kids and hubs know of my problem. So many times, they have walked into the room to witness my waterworks and shake their heads in shame. Yet I am not ashamed. I am human. And a girl. And I LIKE STORIES THAT MAKE ME FEEL GOOD, THAT MAKE ME SEE THE WORLD AS A BEAUTIFUL PLACE! Embrace the feelings, everyone. Embrace the stories of Christmas! And please, I realize that Thanksgiving is yet to happen and understand that I LOVE that holiday too! I do enjoy the Thanksgiving movies too. There are just A LOT less of those. So unite sappy movie lovers! Unite! Tis the season. The fabulous Rena Olsen invited me to join the terrible title blog hop. Since Rena is my Queen, I shall participate. If you don’t know her, well, do it, she’s very talented and a great friend. And referred to me as an angel with a dark and twisted soul… which makes me love her more. So, the point of this blog is to scroll through my manuscript of choice and stop in random places, creating titles from whatever words I find. Gee. Now I’ll definitely go back and retitle it I Don’t Care, I mean really that grabs the essence of the story. Or Cal’s Mountainous Form? Oh good heavens. I am ashamed. Eee-Cree makes me giggle because the character, a four-armed fur-ball, is special to me. I love him. I’m supposed to tag people, but I don’t know who. So sue me. IF you read this and think… HOW FUN! Do it! Anyway, I’m off to school to see my daughter read a poem she wrote for the Veterans Day celebration. It’s a darn good poem, kids. I was shocked. Especially, since she told me that she scribbled it down cause she HAD to. And now the poor girl has been chosen to read it aloud … in front of people! Today I need to smile. I need to laugh. Basically, I’m being me. Classic. Let’s forget the stress of training a puppy. Of waiting for answers. Of over thinking a story (that has to be submitted tonight!). Of wondering if I’m good enough. Of wanting to hide because I’m sure I’m not. Because life is full of good. And believe in the silliness. No matter the strange looks that might follow you. Hello, November, You Sassy Girl. I’ll wave goodbye to October, but what a month. Contests, stories, scary fun. I let go of worries and fears and let myself be. I wrote a ton of little stories, which lead my writing into new places, places I’m hoping to explore further. Horror manuscript? Possibly. But first there’s a story competition I must complete. Some of my writer friends are participating in NaNoWriMo… National Novel Writing Month, where they will attempt to write 50,000 words this month. Good luck to all of you! I think you’re all crazy. I have never been tempted by that beast, never thought to join the insanity. There’s another group forming called… WIPmo, for all those who have manuscripts and want to revise the living crud out of them. Good luck to them too! I don’t have a ms that is screaming to be revised. I just climbed out of that hole with DOORS. I don’t wanna go back in! A different game has me enthralled. Last year I stumbled upon Reuts Publishers and their take on NaNo called ProjectREUTSWay, see details here. Each week in November they offered a challenge. By adding vampires, shapeshifters, demons, ghost, etc., write a 2,000-5,000 word story inspired by a fairy tale. So I did. I submitted four stories. Two of them won spots in their recently published anthology, see my previous post here. And one was posted on their blog as a runner-up. I am thrilled to have a book in my Nook with my stories sitting alongside so many other great pieces!Honestly, I don’t feel like I deserve to be there, but there I am. This month the theme is mythology, not something I know a ton about. First up is Egyptian… I’m going with part of Ra’s story. I will start writing the words today and see how it goes. I am in fabulous company as many of us from last year have bonded together to cheer each other on. I love them! I love that they include me. The little girl inside me who never had any friends wants to cry happy tears. This month, I will write four stories. I will help critique a friend’s manuscript. I will have a big decision to make, maybe… or at least something to announce, possibly. I will head to my sister’s house for Thanksgiving and spend time with my family. I will do my best not to panic or let my fear of failure send me spinning off into darkness. But if I do, I have friends to help me. You know who you are! Mostly I hope to be content, to be willing to go where fate takes me and let go of all the things I can’t control. YOU ARE NOT ALONE. Reach out to all of us, suffering from the same fears and doubts.